But, while a nice crossover, it has been caught and surpassed by several others on the market, Subaru’s Forester is the most recent. Mazda’s CX-5 is another. 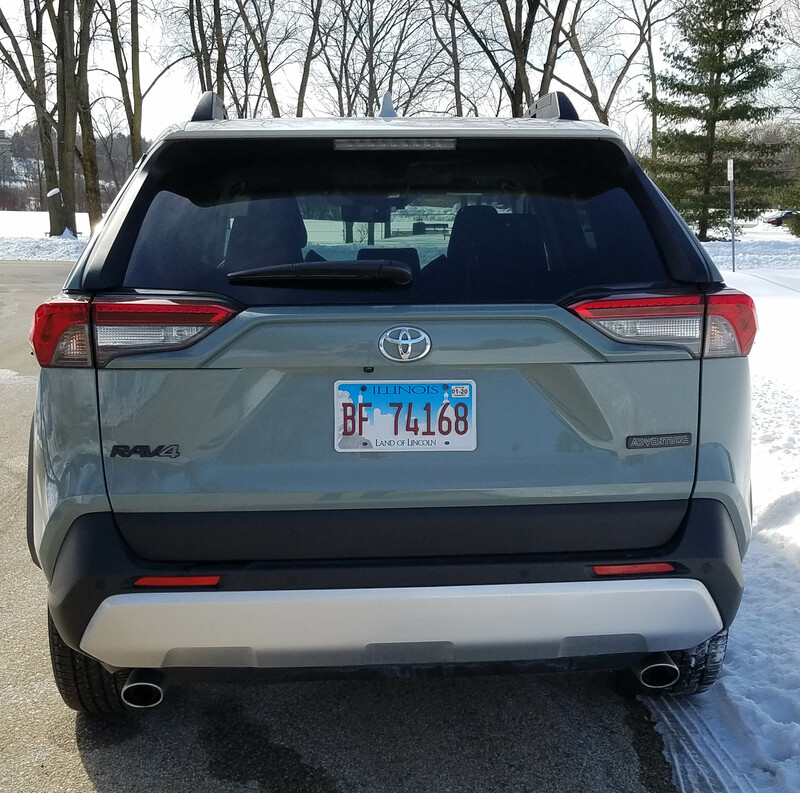 The RAV rides on a 105.9-inch wheelbase, same as Forester, but ride quality is nowhere near as comfortable and controlled. This crossover’s ride is bumpy and severe in our northern climate’s pothole-strewn roads. Every bump is felt. Plus, while Toyota uses its 2.5-liter dual-VVT-i (computer-controlled variable valve timing) I4 engine that creates 203 horsepower and a torque rating of 184, the power seems hard to come by. Driving normally in the city I found myself pushing hard on the accelerator to catch up with other traffic and the 8-speed automatic didn’t seem to want to downshift for power unless I mashed the pedal. The result, you feel the RAV is a bit pokey around town. The crossover cruises well at highway speeds and while there is some road noise, it’s not excessive. There is some major transmission and engine growl though when pressing that gas pedal hard for city driving. Three drive modes, engaged via a console dial don’t help much. Normal is the default and Eco only further slows acceleration. Sport helps boost power, but only slightly, yet firms the steering feel. Handling is fine, exactly what you’d expect in a small crossover, but not as sporty and responsive as the previously mentioned competitors. AWD was standard on the medium gray test model, the Adventure trim, which is down one from the top-level Limited. Adventure is aimed at young outdoorsy buyers, offering two-tone paint and snazzy orange trim inside to brighten the black interior. That AWD was a godsend on a couple snowy days during the test drive. The crossover also has a snow setting that is simple to engage and kept me from spinning my wheels in slush. 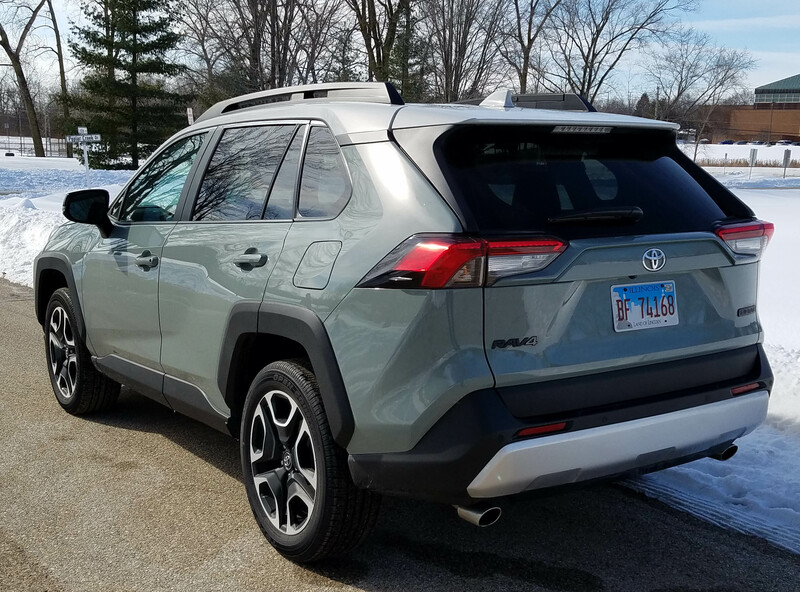 The test vehicle added a white roof ($500 extra) that gave the RAV a snazzier look although its gray paint job on the vehicle’s body was not inspiring. 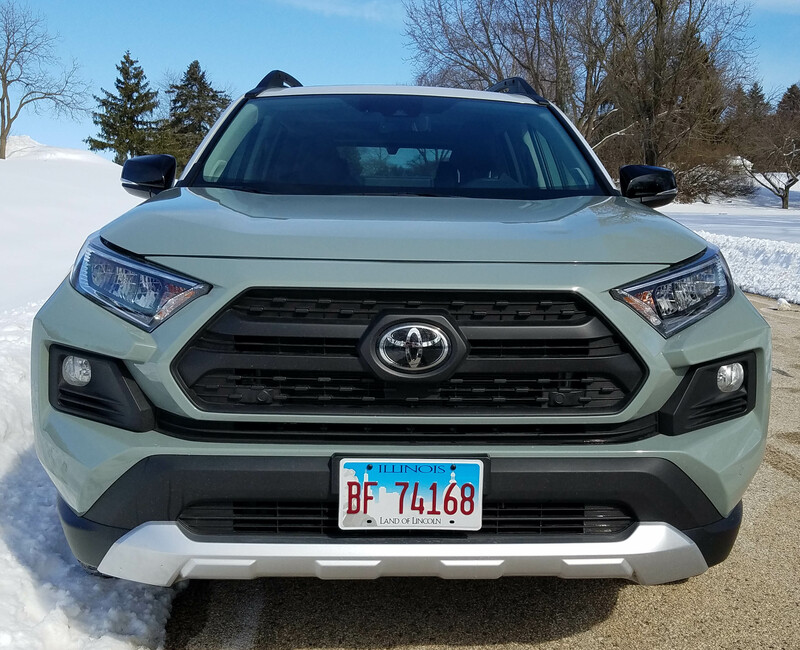 It really blends into the gray of a Wisconsin winter and dirty snow. Inside, the RAV was comfortable and attractive with mostly easy controls. Seats were black SofTex, a faux leather that feels much like the real deal, with orange stitching to make it more attractive to buyers younger than 30. Likewise the cubby trays on each side of the dash were a rubberized orange, as was part of the wireless recharging area under the dash’s center stack and trim around the console’s cup holders. The air vent and console trim and door pulls were a matte silver. Seats are well-formed and comfortable and the driver’s seat was powered, but not the passenger’s seat. 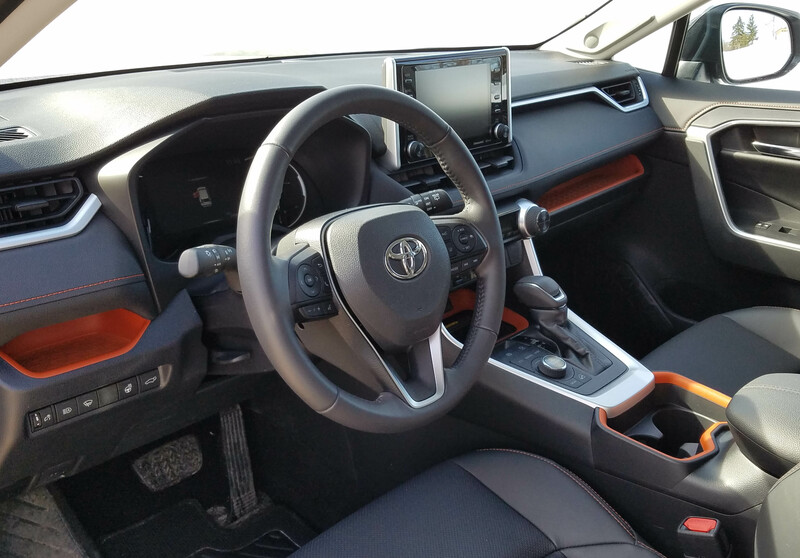 The tested RAV’s front seats were heated and cooled too, part of a $1,185 option package that also added a heated steering wheel and rain-sensing wipers with a de-icer function. That package seems well worth its cost for Wisconsin drivers. 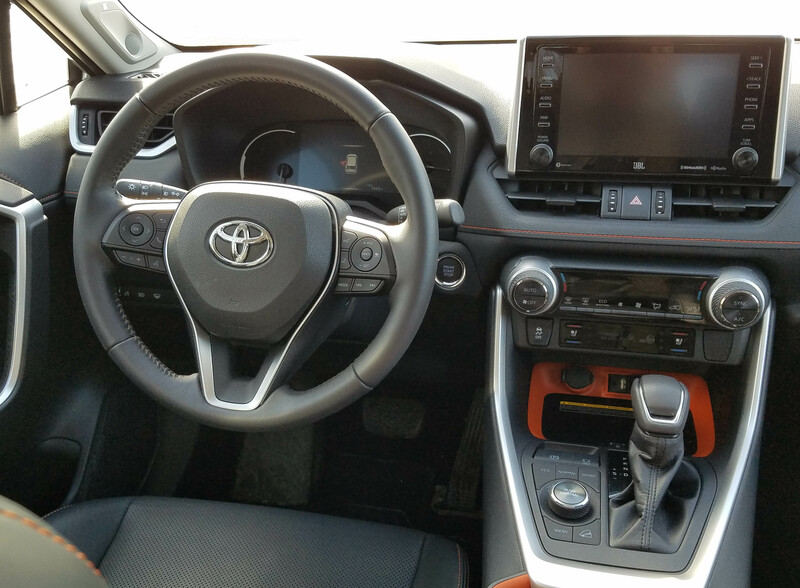 I also like Toyota’s touchscreen and Entune infotainment system. Everything was easy to use and figure out. This model carried an 8-inch screen that along with Entune, a stereo upgrade, an HD radio, a bunch of charging ports and wi-fi hookups add $1,620 to the bottom line. Apple CarPlay and Android Auto also are part of the package. Like most vehicles, the touchscreen did not respond when I touched it while wearing gloves. Some vehicles’ screens do, but not many. Climate controls were mostly easy to use with large dials for setting the dual temperature controls, but tiny directional buttons if you want to stray from the automatic climate setting, or engage the rear window defroster. I found the interior roomy enough for five adults if no one is Andre the Giant sized. I had four folks aboard and all were plenty comfy. They also liked the sunroof ($850 extra) and were impressed that there was a wireless charging station under the dash’s center stack. 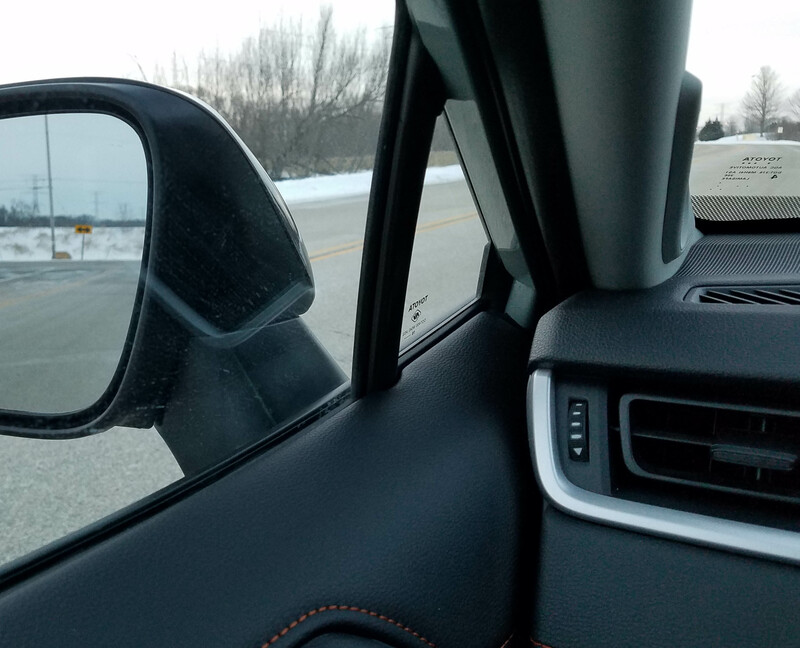 Several commented too on the small vent-style window by the side mirrors, a wise design feature to increase side visibility. Behind the split fold-down rear seats is generous storage room too, along with a power rear hatch. Toyota Safety Sense is standard on all Toyotas now, a big plus. TSS includes smart cruise control, a pre-collision warning system that can detect pedestrians, lane departure alert with steering assist, automatic high beam headlights and a system that reads road signs to further alert you when a stop sign is ahead, or the speed limit changes. A blind-spot monitor also is standard. Like the little vent-style window as it helps improve side-to-side sight lines. 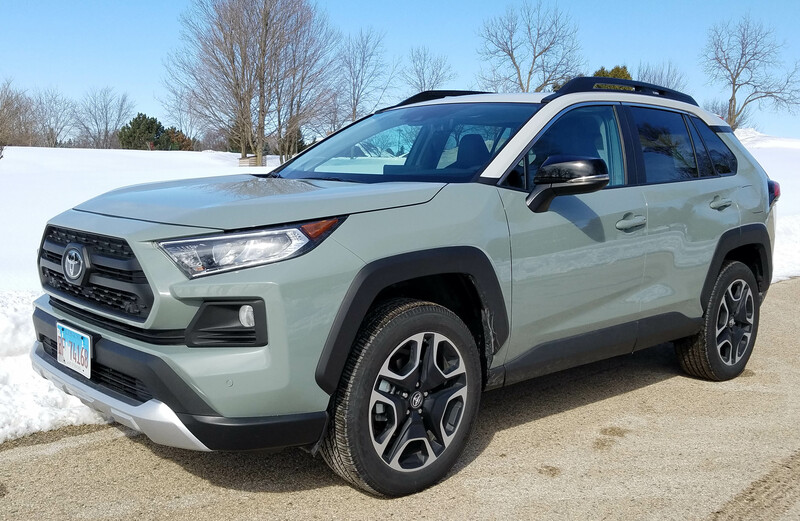 An Adventure tech package costing $1,265 adds that smartphone charging, plus digital display rearview mirror with HomeLink, and intelligent clearance sonar with rear cross-traffic braking to help avoid parking lot dents and dings. Once you add all the options the test RAV soared from $33,945 (including delivery) to $39,634. That’s pretty close to entry-level luxury crossover territory and the RAV is certainly not a luxury vehicle. A base RAV4 LE starts at a low $26,545, making it quite the deal. That price climbs through five trim levels to $34,545 for the Limited. Without a lot of add-ons all are good values and can fit a variety of pocketbooks. On the gas mileage front, RAV4 rates 25 mpg in city driving and 33 mpg for the highway, according to the EPA. I managed just 24.4 mpg, but again, was driving in sloppy, snowy and then bitterly cold conditions. In “normal” weather the EPA numbers seem more likely. Also know that a hybrid model, the XSE HV is available and gets better gas mileage. It starts at about $35,000. If you want an economical crossover look at one of the lower trim levels and don’t go crazy with options. If you want one with sportier handling and smoother ride, test drive the Subaru and Mazda for a comparison, plus Nissan’s Rogue offers a much more compliant ride. This is a crowded market segment. Study it well before a purchase! 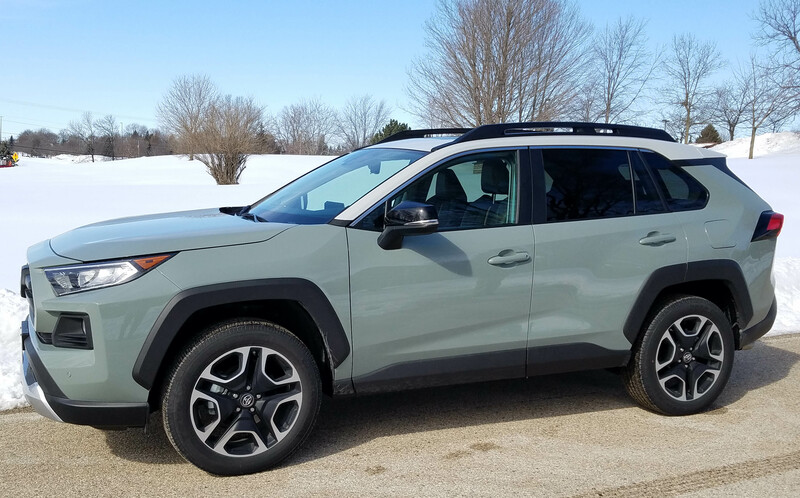 Hits: Jeepy looks, easy touchscreen, power hatch, comfortable heated/cooled seats, heated wheel, sunroof, wireless recharging, and snow setting for AWD. Room for five adults. Misses: Struggles for power, bumpy ride, modest mpg and high pricing for Adventure model with options.